Every day, I watch and listen to my husband work with our son on his letters, his numbers, his name, his address. It's amazing to me how fast Zane picks things up, but it is all because of Larry. Zane's father is patient, never raises his voice, and is effusive in his praise when Zane "gets it". And Zane does get it. My husband IS a teacher. He has a gift for it, although he would deny it. I think that he would be a great special education teacher, but I know that the ridiculous amount of paperwork would kill every single spark of enthusiasm Larry ever had. The paperwork for a 'regular' teacher is bad enough. This year, he has a new principal. We all know that it's the principal who sets the tone of the school. If a school environment is hateful and negative, or if it is a positive place with high expectations, look to the principal. School hasn't been very fun for my husband for the past couple of years, with crappy budget cuts and a demand for higher scores on the state assessment. My husband was understandably nervous about his new boss. And then this principal scored many bonus points(DKP, in gamer lingo). She said that the teachers could dress up in 80s fashions for the pep rally. So Larry did. 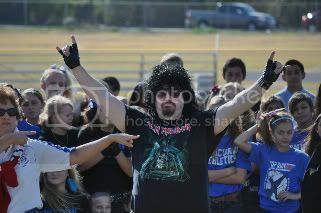 I never understood the whole Iron Maiden thing, but I can't deny that my husband is having a great time at that pep rally. The kids loved it, too. It was a complete attitude adjustment for everyone. I think that he is going to have a great year! He sounds like a great dad and husband! And, by the way, I love your son's name. My dad used to read Zane Grey's books to me when I was younger... I still love them! Lol--that is where I got the name Zane, Betsy!